This beautiful ring is hand tied and it is made with one continuous piece of pure silver wire coiled around a nylon string. 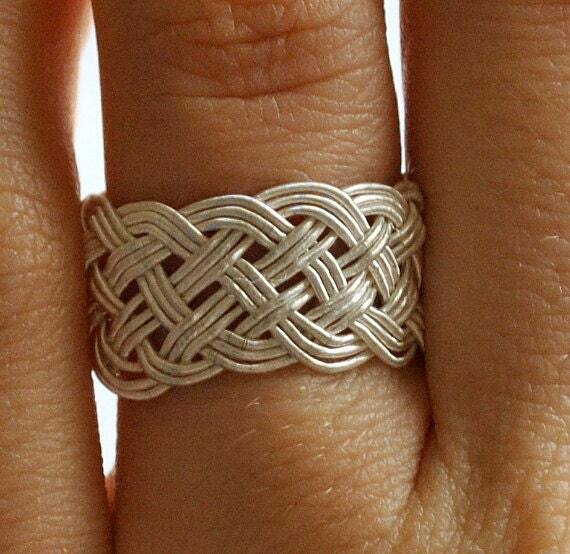 The thin twisted wire makes the ring flexible, soft and very comfortable to wear. It can be worn by people who suffer from arthritis too. The ring has 6 leads and 13 bights. This style of braiding is called kazaz. Kazaz technique is specific only to a city in the northern side of Turkey, called Trabzon. This thin fine silver wire coiled around a thin nylon string can be found only in Turkey and it is specific only to kazaz tecnique. Ring size: approx US 7 1/2. Width measures 1/2 in (1.1 cm). Always measure your fingers when they are warm. Never measure your fingers when they are cold. This ring is ready for shipment. I will ship this ring in a cute gift pouch. Shipping upon receiving of cleared Paypal payment by registered air mail through Turkish Post. Approximative delivery time: 4-8 days to Europe, 6-16 days to U.S.A.